It’s been quite a while since I last wrote. I have no real excuse, just a general malaise with everything. I guess a mild semi-depression that I am working my way out of. HEALTH – this is the biggie. The growth found on my annual physical in February has now been excised and a biopsy performed. And the best news – it’s benign. I am so relieved. However I couldn’t tell you the last time I went to boot camp & right now, I’m sticking to walking. WEEK IN THE LIFE – I have completed my album – which was an achievement in itself! I am not happy with the volume of notes I made, & luckily I have enough in the way of embellishments that I can repeat the exercise in November (before December Daily). Ali’s newest Travel collection is somewhere in the NZ Post system so I hope to get that later this week. Photo post to come! TRAVELLING – We’ve done a few small trips lately, as you would know if you followed my Instagram. We tried to get to a car wrecker in Whangarei the other weekend but due to an accident (no fatalities but two hours on a 2km stretch of road was frustrating) we couldn’t get there before closing. We ended up staying at Lang Beach, just south of Waipu Cove & did a lot of exploring around Whangarei. I also caught up with a previous workmate Jill, who has Si’s total admiration for sailing around the world (multiple times as long term readers will know) and not killing her husband in tight confines. Last Saturday we got up early, drove up & found the bumper we needed for the Toy Car – and the targa glass panels and covers & some other bits too! Also if you’ve coveted one, I can confirm that a Blunt umbrella is awesome. I got myself the Karen Walker limited edition, as it’s pretty and the odds that the boys will want to be seen using it are low! OTHER STUFF – the Auckland Photography exhibition is on and Rory, a friend & official Briscoes photographer, has an exhibit on at the Wintergarden Café by the Auckland museum. His theme is birds & flowers & there were some pretty things. I went to a number of NZ Comedy Festival events – the 7 Days live screening with Louise, Paul Choudry with Si & then Lou treated us to Jamie Bowen – whose surprise guest was Dai Henwood. It wasn’t comedy as such, more a discussion around a wide range of ideas/events, but it still had laughs and things to ponder. I liked it. I cleaned and re-stocked the big tank. Tubbs is happier! I do have the smaller tank still set up, much to Si’s disgust, and I think I will get some more mollies and a betta for this one – plus a new light. It needs a light desperately, now its winter and the sunshine hours have reduced. READING – a lot of trash interspersed with some good writing. June/July looks good for me, with a lot of my fav authors released or releasing for the Northern Summer. I read the latest Rosalind James as part of the pre-release group; there’s a Nalini Singh Psy-Changling & a Tracey Alvarez Bounty Bay next week, a Kirsten Ashley Chaos & Eloisa James Wilde in July, and two LH Cosway to come (all pre-ordered to my Kindle). I had forgotten about the last two Nora Roberts releases so they’re on my Kindle now too. Non-fiction has been Brene Brown & “The Year of Less” by Cait Flanders & “Slow” by Brooke McAlary. I brought Si “Spymistress” by William Stevenson for Audible and he recommends that one. I also brought Cocktales, not for the writing but because of the cause. If you are not a romance writer you may be unaware of the huge uproar over a certain author deciding to trademark a word, which in this instance was “cocky”. Her reasons are as shallow as a bird bath is to the ocean, and multiple organisations are now funding the court battle against her, including an union organisation for authors. I don’t believe any one person can TM a commonly used word (it’s not like Xerox or Hoover, where the brand is now also the action) & I think her actions were malicious in intent. STITCHING – I haven’t stitched all that much since I wrote. 8 instances on the LHN Summer Band Sampler got me to a finish; then 5 sessions on a new start, home*stitch*ness Four Seasons (New Zealand) version which I have quickly fallen out of love with (I think it’s the Cashel fabric, it’s not evenweave & very scratchy); two beading sessions on Mill Hill’s Honey Pot so those are now glued onto felt and ready to cut out as FFO’s; and at work/travel I am working on the two Trinidad Santa’s from last year’s Mill Hill/Sandra Cozzolino release. I’m up to the fiddly parts & making sure thread doesn’t carry on the back of the plastic canvas version. And at home I’m back in love with Fairy Idyll and nearly done with the greenery at the base of the rabbit. My round robin also came back; I need to stitch the square left & bead it all but that’s a budgeted finish for when I’m a little tired of FI. 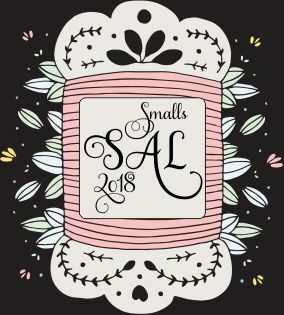 STITCH FROM STASH – I had my first “no purchase” month in quite some time. This at least brought me back from the brink & I finished in the positive. I’ve also sold (for the same price as I paid) the second copy I had of the Mirabilia Cinderella design so this month looks good too. 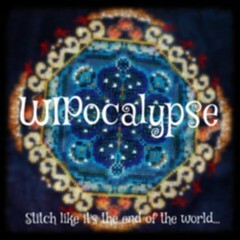 WIPOCALYPSE QUESTIONS: I’ll post these in the June entry. I need to make sure I post more regularly! Long-time readers might remember I raved about a book waaaay back in November 2016. Today’s title is connected to this series and is just as good! It released state-side today, so pop into your local retailer and buy it. SYNOPSIS: Though Israel has found relative peace, Moriyah has yet to find her own. Attempting to avoid the scorn of her community, she’s spent the last seven years hiding behind the veil she wears. Underneath her covering, her face is branded with the mark of the Canaanite gods, a shameful reminder of her past captivity in Jericho and an assurance that no man will ever want to marry her. When her father finds a widower who needs a mother for his two sons, her hopes rise. But when their introduction goes horribly wrong, Moriyah is forced to flee for her life. Seeking safety at one of the newly established Levitical cities of refuge, she is wildly unprepared for the dangers she will face and the enemies–and unexpected allies–she will encounter on her way. MY THOUGHTS: It’s no wonder RT Book Reviews have given this 4 ½ stars – it’s detailed, well-written, empathetic and good. I devoured most of this while at the A&E with my eldest son, & it was hard to put down. Moriyah as a character is well rounded but as we met her, cloistered within her own shame and closed off to the voice of Yahweh, even tho she heard Him as a child. Her scarring means she is the focus of mean comments and she does allow this to influence her daily actions. Things change when her friend urges her to dance; then she meets someone who will influence the remainder of her life. At one point so much happened to Moriyah that it was a bit rollercoaster, but on a re-read this might well smooth out. I am in awe of the amount of research that went into this book. The background is so rich and colourful and seamlessly enhances the story. The theme of redemption thru sacrifice resonates. I received an ARC of this title in exchange for an honest review – but I’m buying it anyway! Book 2 is scheduled for this year; book 3 for 2019. Synopsis: Growing up in a clergyman’s home gives Jane opportunities to observe human nature at its best—and worst. Vivid and delightful characters pour from her pen—Elizabeth Bennet, Fitzwilliam Darcy, Emma Woodhouse, Fanny Price, John Willoughby. . .
Jane dreams of publishing her stories and sharing them with the world, but how can she? She’s just Jane from Steventon. Will anyone ever read her novels? It was interesting to read & pick the gaps between actual Jane history and what was fiction (& unless you’ve done extensive reading, good luck in picking those bits out). The family is well fleshed out, as is the environment and time they live in. Four and a half stars from me – & I’m off to read more by this author. Elizabeth – have you read any Moser? BLURB: The last person Griffin Shipley expects to find stuck in a ditch on his Vermont country road is his ex-hookup. Five years ago they’d shared a couple of steamy nights together. But that was a lifetime ago. MY THOUGHTS: I loved this book. I admit, I was kind of disappointed there was no hockey hottie (my intro to Bowen was thru her hockey romance series) but by about chapter 3, I was hooked. The primary and secondary characters are so well crafted, the dialogue and editing are spot-on & I even learnt heaps about Vermont, organic farming, restaurant supply chain & (nom nom) cider. If you don’t like the sensual scenes, I would still recommend reading this title. There’s a lot to enjoy. I’m already deep into Steadfast, book 2. FYI, I brought these titles on my Kindle, & they are widely available in e and print versions. BLURB: A series of tragedies brings Vivvie’s young grandchildren into her custody, and her two estranged daughters back under one roof. Jackson, Vivvie’s husband, was shot and killed thirty years ago, and the ramifications have splintered the family into their own isolated remembrances and recriminations. Sisters Elin and Kate fought mercilessly in childhood and have avoided each other for years. Elin seems like the last person to watch her sister convalesce after an attempted suicide. But Elin has her own reasons for coming to Kate’s side and will soon discover Kate’s own staggering needs. This deeply personal, hauntingly melancholy look at the damages families inflict on each other—and the healing that only they can provide—is filled with flinty, flawed, and complex people stumbling toward some kind of peace. Like Elizabeth Strout and Kazuo Ishiguro, Deborah Reed understands a story, and its inhabitants reveal themselves in the subtleties: the space between the thoughts, the sigh behind the smile, and the unreliable lies people tell themselves that ultimately reveal the deepest truths. MY THOUGHTS: This is my first Reed read (ha!) but not likely to be my last. I’ve enjoyed the way the author can weave past & present very, very smoothly and the way that life is portrayed as a cycle. I actually found part of that cycle woke memories that I try hard to keep buried. Being raised primarily by a (at times) mentally unstable parent is not easy. Not to put down the character of Vivvie, but I saw similarities between her and Kaye, especially when Vivvie was at the end of her coping times. I know why Vivvie took the actions she did; & I strive to be the opposite in my life. Perhaps I’m trying too hard, but that’s not an open conversation for a blog! I guess everyone carries a burden of some kind. Four stars, easy to grade, harder to read. I read this book as part of my Kindle Unlimited subscription. SYNOPSIS: Connie Carter has lost everybody and everything dear to her. To help nurse her grieving heart and to try and find answers, she moves from her home in America to Ludlow Hall, deep in the Irish countryside. All she knows about Ludlow is that her late husband spent all their money on the house – without ever mentioning it to her. Now Connie needs to know why. REVIEW: I found this novel both freeing and heart-breaking all at once, kind of like a modern Maeve Binchey. Not wanting to be too dramatic about it, but the first time my daughter went away on access, it felt like I had lost her. That doesn’t put me anywhere near the scope of anyone whose child has died, but it did allow me to empathise with the behaviour and mind-set that Connie portrayed. The way the author unfurls the characters is organic (I know, I’m getting all fancy up in here) and the pace suited the story and themes. There are obvious things that happen (which I won’t go into) but even those enhance the plot and character growth. Easy five stars & one on the re-read shelf. As per, I don’t seek to fund this site so the following link is non-affiliate. I was introduced to the title through Bookbub, but you can read a sample chapter on the publisher’s site HERE & find links to various purchasing sites. I’m definitely going back for the author’s two previous titles! I’m a sucker for books about my own country/environment. Add on romance, a hot book boyfriend and I’m sold (Rock Hard, anyone? https://sewscrapmuse.wordpress.com/2015/03/12/review-rock-hard-by-nalini-singh/ The concept of the plot isn’t too far out there (find me a girl who hasn’t dreamed of a bf that’s a sports/rock/movie star, & I’ll show you a liar) and the secondary characters are funny and well crafted.